Before businesses start receiving Managed IT Services, they receive a technology assessment. Often times, business owners don’t have a clear picture of their business technology and the impact it has on their organization. 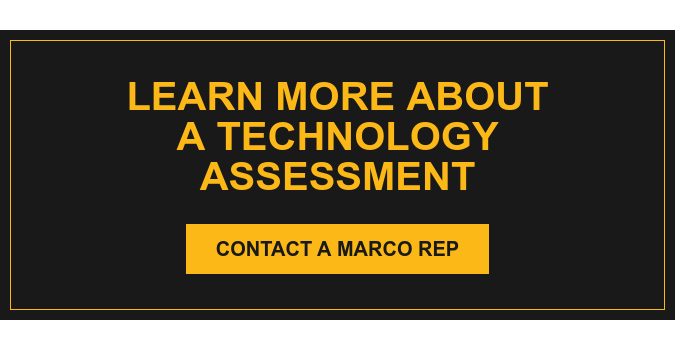 Marco's technology assessment solves that problem. A thorough business technology assessment lets us get to know your business technology inside and out. And we use that information to show business owners and key stakeholders exactly how their current business technology is functioning within their organization. In order to get a baseline for understanding your organization’s technology, we perform an on-site audit. This audit is the most tech-heavy component of the assessment; but in the simplest terms, it involves deploying software and sending an on-site technician to your location. Most importantly, the technician moves through an IT assessment checklist, which he uses to build out a picture of your current hardware. In terms of technology assessment tools, the software allows us to gather information on how your current technology is functioning. Download the IT Assessment Checklist here. After the data is collected and analyzed, we organize it based on the 12 key technology areas listed above. And, we organize it based on the level of risk each area currently poses to the organization. Each area will be ranked either high risk, moderate risk or up to industry best practices. Then, we outline what those risks are, how they impact your organization and what can be done to decrease or eliminate them. The findings are presented in a clear, non-technical presentation that gives business stakeholders a complete understanding of the current state of their business technology. Our technology assessment template was developed to show business owners their technology landscape in a way that is easy to understand.